Television advertisements, newspaper advertisements are part of traditional marketing that cost a lot. Well as, digital marketing can decrease your cost, it helps in saving money and even new start ups can afford digital marketing. Traditional marketing, takes time, it may take weeks or months, to boost your business. In digital marketing, the results are fast, it doesn’t take much time. The difference between Traditional Marketing Service and Digital Marketing Service is that online marketing or online advertising helps to elevate your brand image because in traditional marketing the space is limited and the incidence of advertisements is low, making digital marketing more popular. In Digital Marketing you have the whole website to advertise rather than a column in a newspaper. You can also start your own blog or create a page on social media, through this page; you can portray a steady image of your business that will help in branding. This is not possible when your advertisement is aired on radio or if posted in newspaper. Traditional advertising is mostly ignored because people do not buy newspaper for the advertisements; people listen to the radio for weather forecast or music, not advertisements, Magazines are bought for its topics and content and not ads. In online advertising, the customer can choose, if they want to see the advertisement or not. 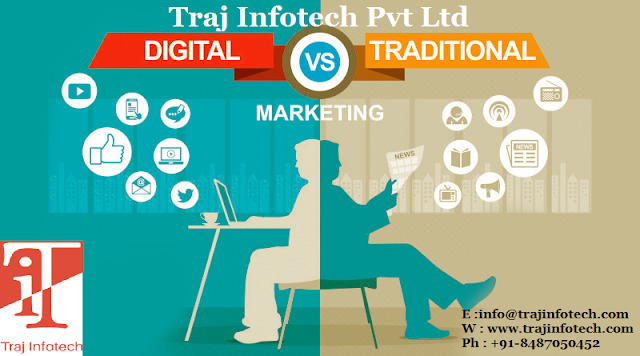 Digital Marketing can reach out to the whole world; traditional marketing has its limitations. Traditional marketing does not allow you to interact with your customers. Online marketing will let you connect with your customers and keep them engaged. For immediate publicity, Digital Marketing is the best, compare to traditional marketing. For Digital Marketing the size of the business does not matter. In traditional marketing, small business is at loss. Companies using digital marketing are ahead of companies that depend on traditional marketing because through analytics, they know what works for them and what doesn’t.